A proof version (pictured above) and a business strike version where struck at the West Point Mint with a mintage of 651,659 for business strikes and 214,225 for proof strikes. The design is attributed to Marcel Jovine. 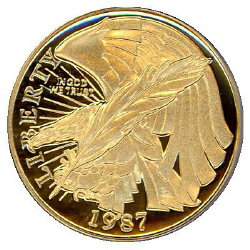 The value of PR67 and MS67 coins both begin at $185 each. I would consider the proof version to be a sleeper considering the lower mintage and BV compared to the business strikes. I have viewed only a few gold coins. But this coin grabs my eye. I do like the St. Gauden $20 piece. 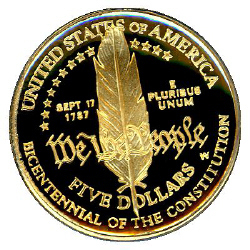 I like the reverse with the feather and the constitution in the back ground. Cool. I like this piece also. It stands for something important and has a pleasing design.